I w as recently in a hurry to make a 7:30 movie and didn’t have time to eat dinner beforehand. Starving, I contemplated gorging myself on Twizzlers and Sour Patch Kids from the Regal Cinema concession stand until I saw that they offered personal sized Freschetta pizzas. I figured a pizza would probably cost more than my movie ticket due to notoriously high movie theater mark-up, but I was pleased to learn that one could be had for less than $7.00. Since it would definitely take more than $7.00 worth of Reese’s Pieces to fill me up, I took the pizza plunge. After ordering it, however, I learned that it would take 6 minutes to prepare. The bow-tied worker behind the counter then informed me that I had the option of having it delivered to me in the theater if I didn’t want to wait. I was skeptical (How would they find me in the dark? Would they do the sideways shuffle down half a row if I was sitting in the middle of the theater? ), but I took his offer since I was late. I walked away while still pondering my doubts and then I realized that he hadn’t even asked me what theater I’d be in. I went back to inform him, but he didn’t seem too concerned with the information. Somehow, the pizza arrived a short time later with little drama. It tasted great and was slightly larger than a Pizza Hut Personal Pan Pizza. It turned out that instead of worrying about how the pizza would arrive, I should’ve been worried about what would happen after it got there. Eating pizza in the dark is harder than you’d think. If you’re late for a movie, starving, and don’t feel like inhaling 3 boxes of candy, you should definitely consider the Regal Cinemas In-Theater Freschetta Pizza Delivery Service, even though the whole delivery experience is reminiscent of a scene from Enemy of the State. 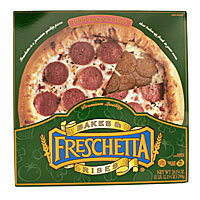 This entry was posted in Food & Drink and tagged Freschetta, hunger, Movies, pizza, Regal Cinemas. Bookmark the permalink.